Cortisol, often referred to as the “stress hormone,” is produced by the adrenal cortex as a response to physical and mental stress. An increase in cortisol boosts mental alertness and raises heart rate, blood pressure and blood sugar, triggering the well-known “flight or fight” response. While this response serves us well in times of crisis, increased or prolonged exposure to stress can undermine good health says Carnegie Mellon University psychologist Sheldon Cohen in a review of scientific literature which appeared in the Journal of the American Medical Association. Cohen S, Janicki-Deverts D, Miller GE. Psychological distress and disease. JAMA. 2007;298(14):1685-1687. Hellhammer J, Fries E, Buss C, et al. Effects of soy lecithin phosphatic acid and phyosphatidylserine complex (PAS) on the endocrine and psychological responses to mental stress. Stress. 2004;7(2):119-26. Monteleone P, Beinat L, Tanzillo C, et al. 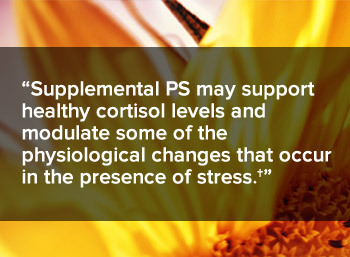 Effects of phosphatidylserine on the neuroendocrine response to physical stress in humans. Neuroendocrinology. 1990;52(3):243-8. Monteleone P, Maj M, Beinat L, et al. Blunting by chronic phosphatidylserine administration of the stress-induced activation of the hypothalamo-pituitary-adrenal axis in healthy men. Eur J Clin Pharmacol. 1992;42(4):385-8.